On a typical day on the eastern side of Lake Tahoe, up 8200 feet in the Sierra Nevadas you will be greeted with refreshing mountain air, the song of the iconic "cheeseburger" mountain chickadee, crystal clear alpine water and breathtaking views. These are just a couple of the rewards to hiking this trail. With an elevation gain of 1140 feet, Marlette Lake, depending on which route you take, is a moderate to difficult trail on a well maintained dirt road that takes you through valleys filled with wildflowers, aspen groves, and creeks. There are a few steeper climbs, revealing Marlette Lake as you make your descend to it's shore. Keep your eyes open to see the various wildlife around you. Because Marlette sits 5 miles from the trail head in the Spooner Backcountry, this pristine alpine lake can only be visited by hiking, biking, or horseback riding in. Marlette Lake is a great place to stop and have lunch, swim, and just enjoy your surroundings. This trail also leads to the start of the Flume Trail and connects you to the Tahoe Rim Trail. 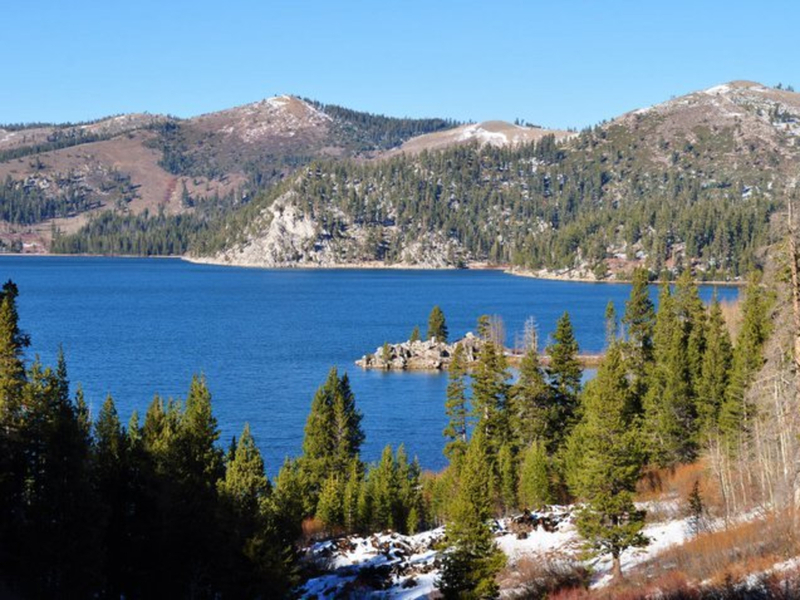 If you have not yet been to Marlette Lake or are visiting the area and looking for a rewarding hike with spectacular views, this is a must visit! First - this trail can be accesses by many types of hikers, newbies and veterans alike. The different options for trail difficulty, along with the spectacular views and quiet alpine lake make this an attractive destination. Second- It is beautiful all times of the year! This trail never gets old when you can view it in all the different seasons. Fall is the most popular time, when all the aspens start to change. Third- You can hike, run, bike, horseback ride, camp and even snow shoe and cross country ski. There are a variety of outdoor activities that make the journey to this peaceful place fun. If you decide to bare the freezing temperatures and visit this lake in the winter, you absolutely must stop and listen to the freezing of the water. The freezing and cracking of the water/ice sounds like an intergalactic space whale and can not be missed. Fourth- Dogs are aloud on this trail. Even off leash. Fifth- While this is not the most popular hike in Lake Tahoe, it has some of the most incredible views. The length of the trip, deters many from visiting this location- if you are up for a somewhat challenging day, the reward is hard to beat and will never be forgotten. This area is a wonderful hiking area for any level of hikers, though more experienced navigators are going to enjoy some of the route finding challenges. From Spooner LakeThere are two ways to access Marlette Trail. The first and main trail is located on highway 28 in the Ranger Station, just half a mile North of the Highway 28 and Highway 50 intersection. This is the largest parking area and costs $10. The second access is a parking lot on the Northeast intersection of Highway 28 and Highway 50. It is a dollar a person to park here- upon parking, you can find envelopes to put your payment and drop into a box at the trail head. From the Ranger station you will see a well maintained dirt road (North Canyon Trail) with a sign that directs you to Spooner and Marlette Lake. This is also where the biking trail starts. At the beginning of this trail you will pass the beautiful Spooner Meadow on your left- don't be surprised to see wildlife hanging out in the meadow. Shortly past the meadow you will come across Spencers Cabin, a pretty cool old cabin that you can look around in. Bikers and hikers will share this road for a little over a mile where you will see the Marlette trailhead start. Hikers will continue to the left and bikers will stay on North Canyon Trail to the right. Hikers are more than welcome to say on North Canyon Trail as well- both trails are equally enjoyable. If you want a moderate/difficult route you will take the left and start on the Marlette hiking trail. It will begin with a slight incline through the pines then by another meadow where you will cross a bridge where the terrain starts to become a little steeper with a few switchbacks. A nice bench presents itself after the 700 foot climb and is a perfect place to stop and take in the magnificent area. Continuing along, you will come to the remains of an old cabin. After this, the trail gets much steeper with several switchbacks that offer spectacular views of the mountain side and rock outcrops. There will be another fork in the road. 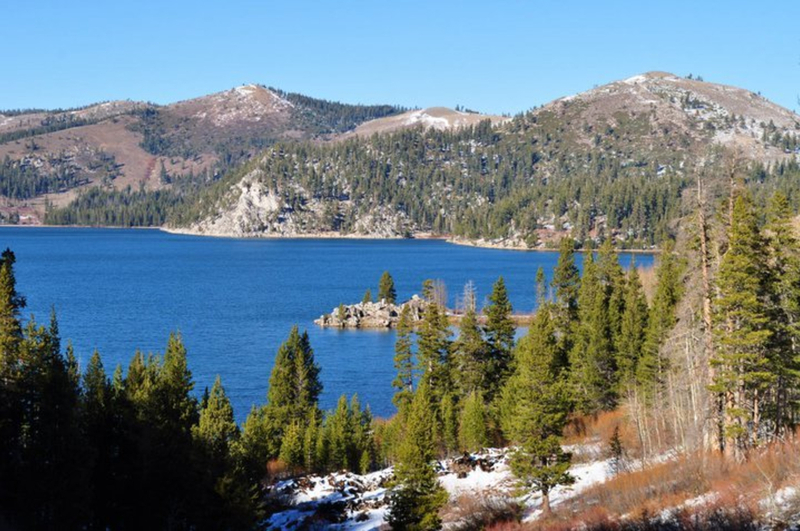 Taking a right will lead you to the southern tip of Marlette Lake. Taking a left will take you another mile to the dam on the west side of Marlette Lake. As you make your descend, you will be reminded why you took out on this adventure with spectacular views of the lake that just get bigger and more magnificent the closer you get to the shoreline. If you want an easier hike or are biking you will stay on the North Canyon Trail. Along the trail you will pass a bathroom and a smaller trail that leads to tent camping locations and a couple of back country cabins that you can rent. You will pass under some pine, walk by large aspen groves and come to another colorful meadow with a stream running though it. You will see a forest service access road (Snow Valley Peak Road) veering to the right- this will lead to many switchbacks putting you on the Tahoe Rim Trail and take you to Snow Valley Peak. Continue straight on North Canyon Trail to reach Marlette Lake. This trail remains fairly flat until about 3 miles in, where, for about a half of a mile, you have a steep slope. Once you reach the top, there will be a nice area to stop and rest before the steep hike/bike down to the shoreline. This trail will lead you to a fork in the road where a bathroom is located. You can go straight where a finger of land jets out into the lake and an old stone chimney rests. There is a road to the left that takes you to the very south end of the lake (where the hiking trail ends) and continues around, following the shoreline to the dam(where the Flume Trail starts). From the dam, breathtaking views of Lake Tahoe can be seen. There is also a road to the right that leads to Hobart Reservoir and Carson City- this road is very popular for off road vehicles.If you park on the intersection of Hwy 50 and Hwy 28 there with be a mile hike along Spooner Lake before reaching the North Canyon Trail. From Chimney BeachThis is a much more strenuous hike all uphill and full of switchbacks. This hike is a little over 5 miles round trip- so much shorter but all uphill fast! This is a very rewarding strenuous hike. Brings lots of water on this trail. Chimney Beach is located about 6 miles south of Incline Village, on the Northeast side of Lake Tahoe. There is a parking lot across the street from the Chimney Beach parking, that is free. The trailhead to Marlette Lake Direct starts on an old logging road. The trail continues on this logging road and easily visible with repeated views of Lake Tahoe. Once you are almost to the top there will be a fork in the road. Going to the right will connect you to the Marlette hiking trail and the North Canyon trail. Going to the left will take you to Marlette Lake at the dam on the West side. The trail becomes a little difficult to see at this point so you need to pay extra attention to make it to the Lake. Continuing on, this trail will will put you just below the dam on Marlette Lake, where the Flume Trail starts.